The Detroit Red Wings have assigned forward Dan Cleary and defenseman Xavier Ouellet to Grand Rapids of the AHL. 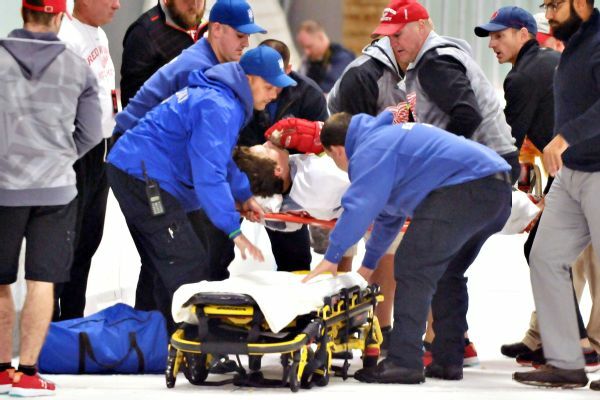 Red Wings prospect Jerome Verrier broke his leg Friday in a collision with veteran Darren Helm that left the team shaken as it opened training camp under a new coach. The Detroit Red Wings have re-signed left wing Daniel Cleary to a one-year contract. A day later, news of the devastating leg injury suffered by Steven Stamkos is still rocking the hockey world. While the dynamic superstar is scheduled to undergo surgery on his broken right tibia, the Tampa Bay Lightning will have to figure out how to manage without the leagues top scorer; perhaps for the rest of the regular season. For those who haven't been paying close attention to the other Insider NHL content this week, it's been a big one: we ran through a mock expansion draft experiment where two of our writers made decisions on which players would be protected for all 30 teams, then drafted the rosters for two new franchises from those left unprotected. Dan Cleary, citing a change of heart after earlier this week agreeing to a camp tryout with the Philadelphia Flyers, instead has agreed to a one-year, $1.75 million deal to stay with the Detroit Red Wings, his agent confirmed. Before we take our lap around the league, let's catch up on the Insider NHL content from Monday -- because there was a lot of it. In the Summer Skate, Hockey Prospectus provided projections for the St.
As training camp with the Toronto Maple Leafs approaches, the absence of a new contract is becoming "more and more of a distraction", according to restricted free agent Nazem Kadri. The Islanders are going to have a new captain this season after the departure of veteran D-man Mark Streit, and there doesn't seem to be a lot of dissension when it comes to the player who is the favorite to earn that designation.